It’s amazing how restaurants are able to serve and cater to the needs of a lot of people in just a short time, especially during meal rush hours. They have a lot of customers, a lot of food listed on their menu plan, but not so much people to do all the work. How are restaurants able to manage all those and other tasks properly? That is all thanks to restaurant checklists. 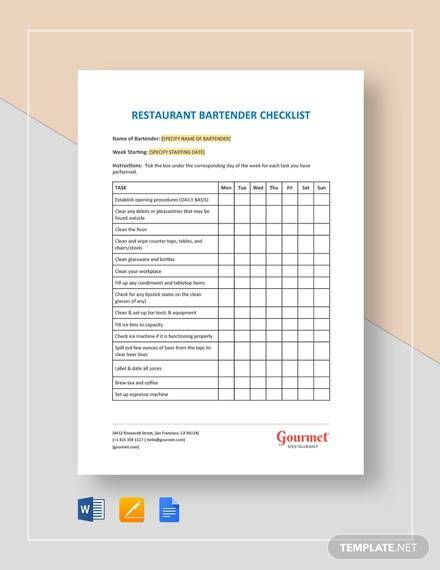 Restaurant checklists, just like any other checklist that you have encountered and heard of, include a list of all the things and tasks needed to run a restaurant. 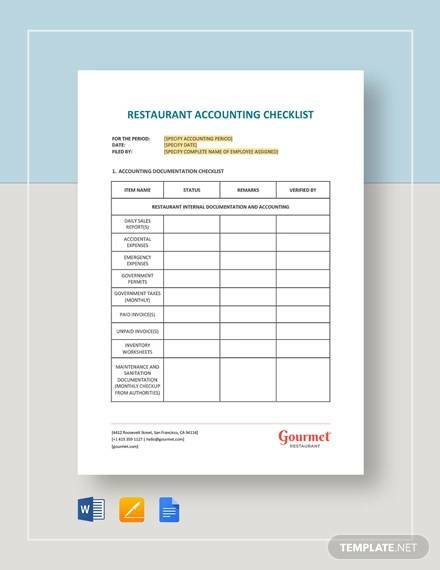 Since the audit checklist is specific for restaurant use, the things and tasks listed on it are specific to restaurants or related to restaurants. Just imagine how great it is to be able to have a handy tool with you. 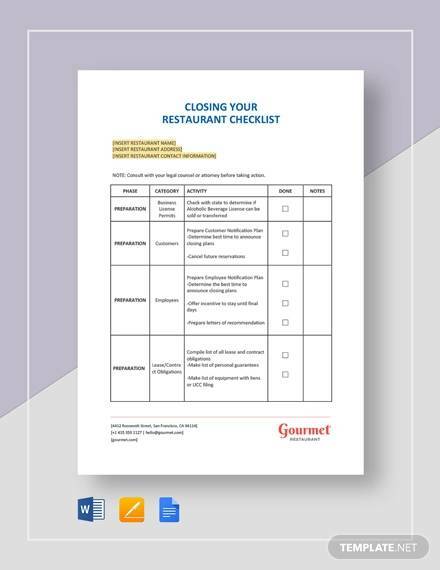 Restaurant checklist templates are available below for you to view and download. Sample Checklists are not really that popular, even to busy people who need them most. This is very true with restaurant checklists. Some think that it is just not worth their time and they can just get by without it. Others feel like it is hard to make and even harder to use. This might partly be true considering that there are techniques or ways that one needs to do in order to be able to effectively use it. 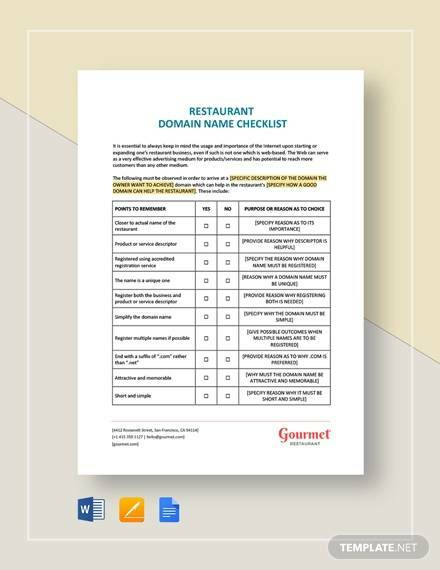 To further understand what a restaurant checklist is and how it works, here are some of its advantages and disadvantages that you need to know.You may also see restaurant flyers templates. 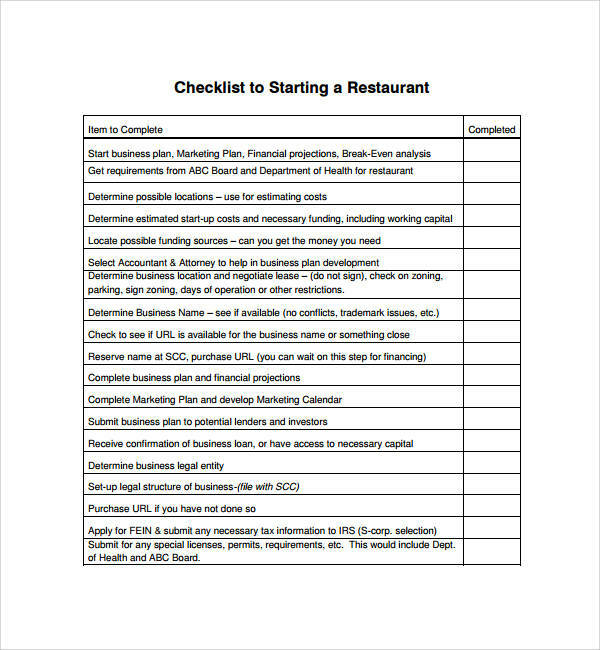 A restaurant checklist lists all of the tasks, activities, and things that are related and necessary in running a restaurant business. Because there is a lot to do in a restaurant business, it is a must that all of the activities be listed to ensure that they are ready when it is time to use them. 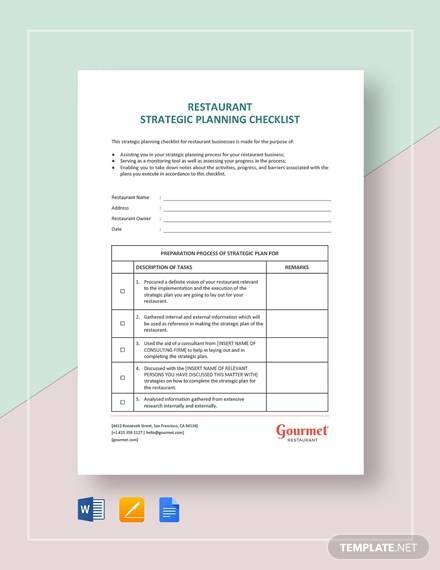 Use a task checklist to help you run your restaurant effectively. 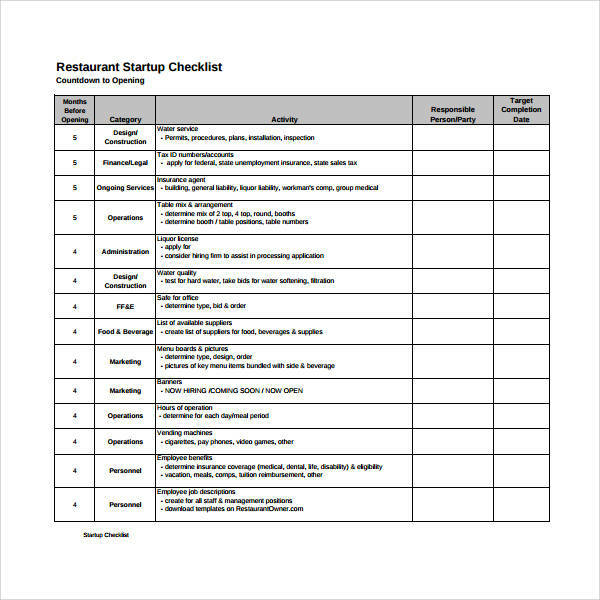 A restaurant checklist helps in the preparation of a restaurant. It can help in preparing for the ingredients for the food to be cooked, before the restaurant opens and before the restaurant closes. These activities are important for the maintenance of the business.You may also see printable checklist samples. 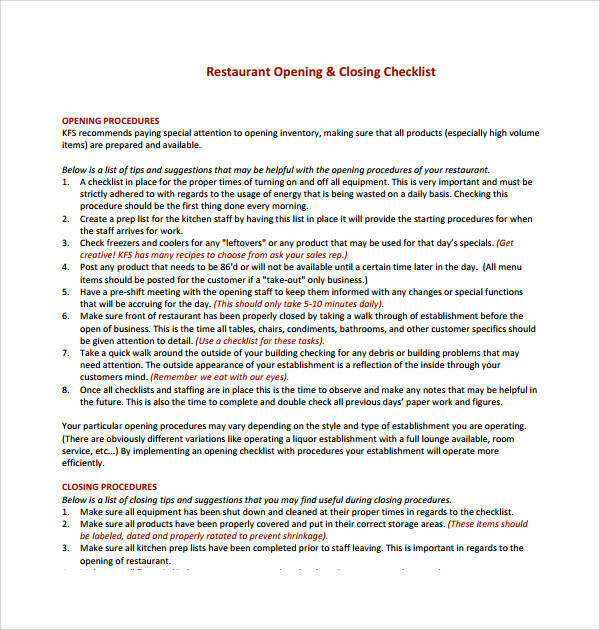 A restaurant checklist helps in the organization and proper management of a restaurant. By having a to do list, work in the restaurant will be made easy and orderly. It will be easy to manage a number of people if everything is organized. 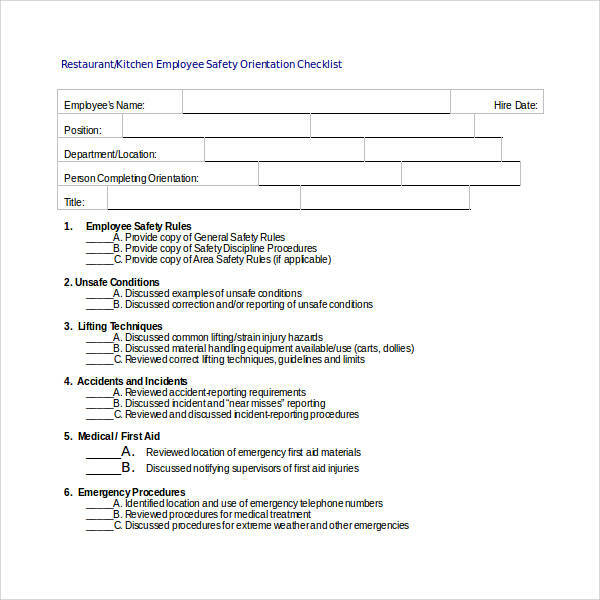 A restaurant checklist helps in the management of the safety of the restaurant, whether it be food safety, customer safety, or the safety plan of the restaurant’s employees. Therefore, some sort of maintenance must be established. Make use of a maintenance checklist to help you make sure you have a safe environment for your business. A restaurant checklist helps in the success of a restaurant by ensuring that all of the tasks needed are prioritized accordingly. Prioritization of tasks is one of the essential things that will help in the success of a restaurant business or any other businesses. If you fail to prioritize what is important then you will see bad results all throughout.You may also see sample restaurant statements. A restaurant checklist helps in ensuring the quality of the services being provided in the restaurant. Because you know what to do and what to check, it will be easy for you to point out poor performance or poor services being provided to your customers, thus, allowing you to make immediate actions and make performance improvements. You can check out inspection checklists, if you’re interested. 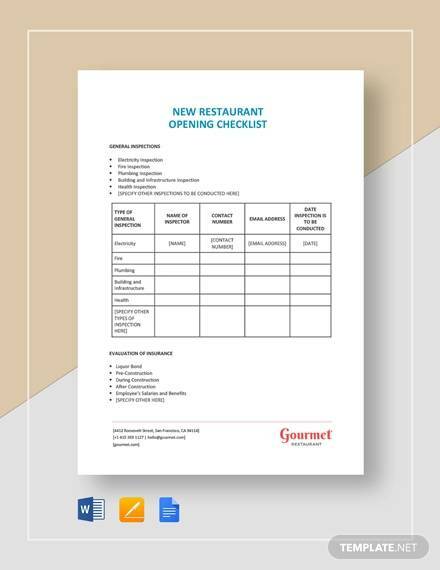 A restaurant checklist ensures that all the necessary ingredients and materials needed for the day’s menu list is restocked and ready so that restaurants will be able to provide to their customers all that they have offered in their food menu. You might be interested in using a daily checklist. 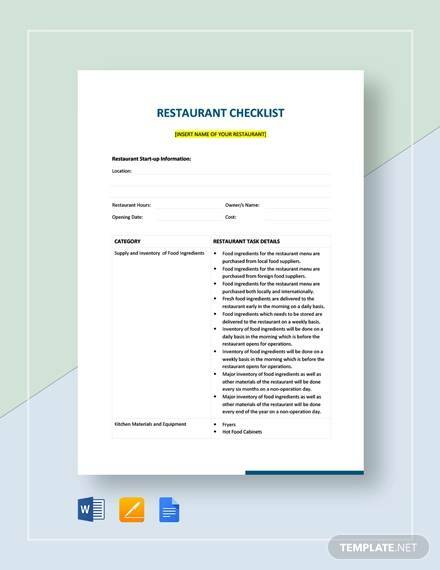 A restaurant checklist ensures that all of the tasks are properly delegated to all of the employees checklist in the restaurant so that all of the orders and other activities can be catered and attended to. This means less waiting time for the customers and more profit for the business. As effective as it may be, a restaurant checklist also has a downside and one of them is time. It is actually both an advantage and a disadvantage. It can save time, but it also takes time. Different restaurants have different needs, so they pretty much need to make their own checklist. Coming up with a complete list of everything related to restaurants is time-consuming as you need to do research and updates every so often. This is needed to make improvements.You may also see restaurant manager job description samples. Using a restaurant checklist gets a little getting used to, to be able to use it effectively and master the tasks and activities that it includes. Not everybody can get used to a lot of different things the first time. Just like the saying “practice makes perfect,” using a restaurant checklist will again take time and practice. Check out how to use a checklist to boost efficiency and reduce mistakes. A restaurant checklist needs to be revised periodically to be able to meet the standards of a particular business and offer quality services that are in league with the trend and in league with other businesses. Revisions are also a way to help make improvements and changes to make the business better. A restaurant checklist needs to be written and created as clearly and as detailed as possible so that whoever will read it, regardless if they are the manager, the cashier, or any of the servers, they will be able to understand it and carry out the necessary tasks listed in it. Learn how to create a checklist by continuing below. 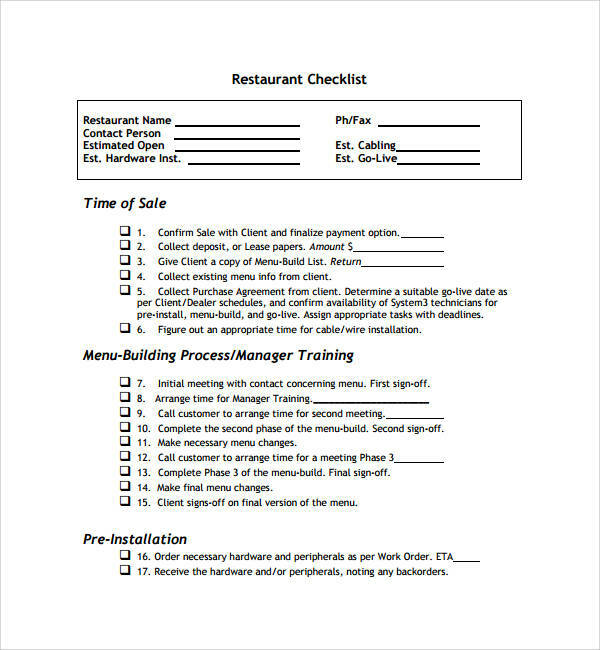 A restaurant checklist is specifically used by restaurants to help them organize and manage the business. The fact that checklists are not that difficult to make still applies to this this type of checklist, just like it applies to employee checklists, project checklists, and checklist for harassment investigations. 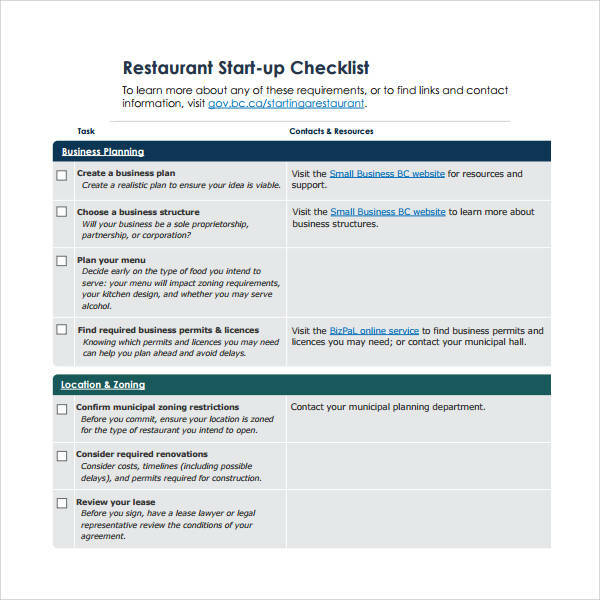 Below are some easy to follow steps on how you can create your own restaurant checklist. You need to know first what things should be done and what things are needed in a restaurant, especially if it is your first time opening a restaurant or managing one. Doing thorough research and taking down notes will help you know all of these things and will make your restaurant checklist reliable and complete.You may also see research paper outlines. Step #2: Make a draft. The next thing you should be doing is making a draft or an outline of how you want your checklist to look like, how you want the tasks or activities arranged, and how you want the prioritization to be. An agenda outline will make your checklist functional, effective, and most of all, easy to make.You may also see sample checklist templates. Step #3: Prepare the materials. Once you are all set with your research and draft, you will now need your checklist template. There are many different checklist templates that you can download online for free. 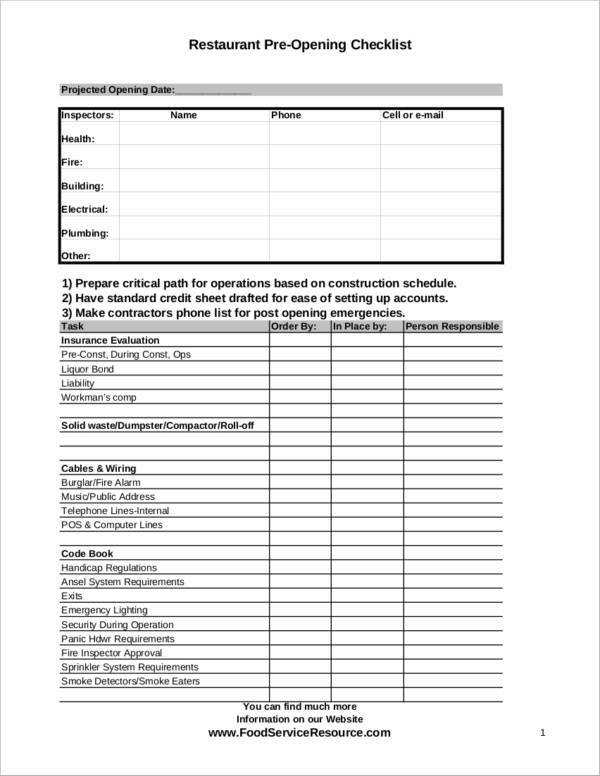 Examples are blank checklist templates and printable checklist samples. They are available on our website and you can download most of them for free! When you have the template that you want, it is time to transfer your draft to the actual checklist that you are planning to make. Step #4: Get ideas from other people. Get tips and ideas from other people who know about running a restaurant, like restaurant owners or business owners that you may know. You can also ask the employees in the restaurant you work in for any additions that they would want to suggest. You can also ask customers about their preferences. The things that you will be able to gather will be a great help to improve your restaurant checklist. Step #5: Review and make revisions. You are almost near the completion of your restaurant checklist. Now you need to review and make revisions to ensure that everything you need is already in there. Make changes if necessary and check that all other details are correct. 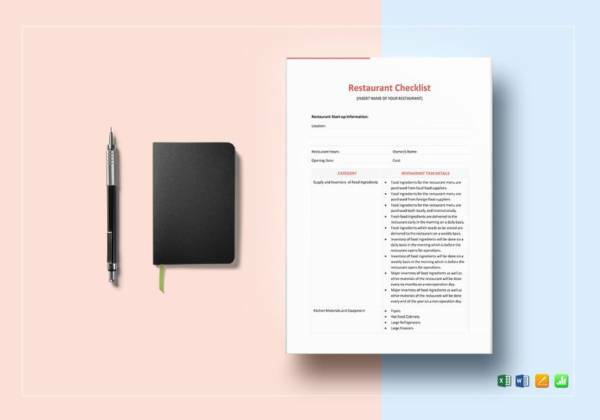 Make sure that everyone who reads the checklist will be able to understand it and read it without difficulty.You may also housekeeper checklist templates. Step #6: Finalize your restaurant checklist. After all those revisions and additional ideas, it is now time to finalize everything that you have made. You just have to make a thorough check of your contents and see if they are what you had changed them into. This time, you don’t need opinions and help from others. This is where you decide what is best and effective for your checklist. Step #7: Proofread and spell-check. Last but not the least, this is one of the crucial steps in any work and this has saved a lot of people from shame. Always have your work proofread and get the grammar and spelling checked. Remember that there will be other people who might need to check the checklist. Making sure that grammar and spelling are correct will make your checklist look professional and reliable. Proofreading and spell-checking should also be done in letter writing, like thank-you letters and application letters.